Hey gang! Welcome to what I consider to be a very special achievement – this is the 150th edition of Pulp. For the last five or so years(! ), I’ve been carrying on about comics ranging from Batman to murderous fairytales to post-apocalyptic sci-fi hellscapes and everything in between. Thank you for reading my ramblings! Given that I’ve been writing Pulp for this long, it seemed appropriate that I take a break for a bit, so I’m taking the next two issues of Forte off – but don’t you worry, folks; Pulp isn’t going anywhere! I’ve organised a guest writer to take my place, so I’ll leave it to the next issue to unleash him upon you. Until then, we’ve got a comic to discuss! This time around, I’ve decided to celebrate Pulp’s milestone with a seminal classic DC tale: Kingdom Come, written by Mark Waid (Daredevil, The Flash) and Alex Ross (Marvels, Astro City) and rendered beautifully in gouache by Ross in what is probably his most famous work to date. Kingdom Come is considered by many to be a true DC classic, and in my opinion, it lives up to the hype. In the near future, the golden age of superheroes is over. Superman and the Justice League are gone, having abandoned their roles as protectors as society embraces newer, more deadly heroes to counter the horrors of the supervillains plaguing the world. A minister named Norman McCay tends to a dying Wesley Dodds – formerly the hero Sandman – and receives visions of an apocalyptic future. Abducted by the Spirit of Vengeance, the Spectre, McCay is told that he must pass judgement on the coming superheroic apocalypse. When Superman is coaxed out of exile by a catastrophic disaster and begins a crusade to force the new generation of heroes to follow the ideals of the past, both a re-emergent Batman and Lex Luthor enact their plans to stop his heavy-handed tactics. With each faction set on full-scale war, Norman must convince a generation of near-gods to become men once more and prevent the end of the world. Kingdom Come is one hell of a book. While I generally approach books revered as classics with a hefty dose of scepticism, I was genuinely pleased to find that Mark Waid and Alex Ross really had crafted a fantastic story. I haven’t always been the biggest fan of Alex Ross’ artwork – I know, not a common opinion – but it really is perfect for the type of story the pair are telling. Ross’ depictions of the major players – Superman, Batman, Captain Marvel/Shazam and especially Norman McCay – are absolutely spectacular, and his use of gouache and artistic style make every character look like they’re ready to step off the pages and into real life. 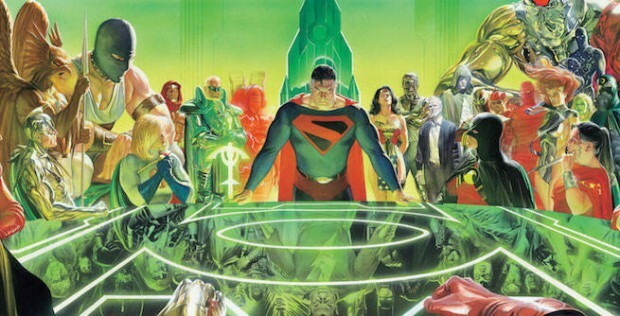 Kingdom Come is the kind of book that every comic book fan should own. Batman v Superman: Dawn of Justice be damned, this is how you do conflict between superheroes! The clash in ideals between the newer generation of heroes – many of them the children and grandchildren of the heroes we know and love – and their more traditional forebears is truly symbolic, and Norman’s desperate attempts to talk sense into the most deadly people on the planet make for some truly powerful moments. If you haven’t already read this book, do yourselves a favour and pick it up – it really is a classic. See in Forte #704, comic fans!